In an industry worth over $12 billion in annual sales, coffee is well loved by millions around the world. In fact, in the United States alone, there are over 24,000 coffee shops. But given the price for a cup of java, it’s pretty self-explanatory why coffee drinkers are looking for alternatives for their fresh brew. Apart from the more affordable cost per cup, there are other reasons why coffee lovers are purchasing their own coffee machine: it’s convenient, they can get the exact flavor they want, and they can make a cup of coffee at 3 a.m. if they decide. There is a lot of freedom and flexibility present with home coffee makers. But when it comes to cappuccino makers specifically, you can’t just purchase a good coffee maker; you have to purchase a good coffee machine with a good frother, as both are needed to make the perfect cappuccino. So here are the top 10 best cappuccino makers of 2018 that are equipped with the quality you’re looking for. 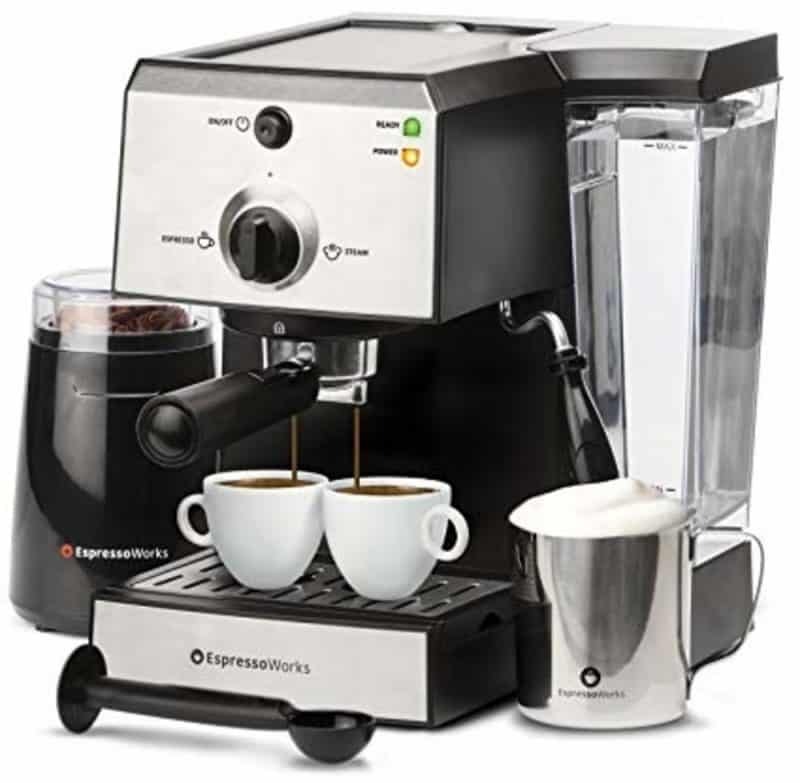 First up, we have the Espressoworks 7 Pc All-In-One is a mid-range coffee appliance with a 15 bar pump pressure system. As you see from the image below, this model is on the bulkier side; but it’s big and beautiful. It also received Amazon’s Choice on Amazon.com for its excellence in providing a quality cup of cappuccino. Thanks to this machine’s ThermoBlock fasting heating system, this model is ready to use in just 45 seconds. After making your coffee, filling up the machine’s water reservoir is easy due to its removable water tank. On top of that, there is hassle-free cleaning with this machine as it offers a detachable frother and drip tray along with two reusable, stainless steel portafilter baskets. If there’s any complaint to be made with this machine, however, it’s that the company claims their cappuccino maker is ready to use within 45 seconds, but other customers found it tends to take longer. Setting this petty con aside, the EspressoWorks 7 Pc All-in-One has an incredible steam wand, is moderately priced yet looks and functions as if it’s double the cost, and generally provides everything you would need in a cappuccino maker. 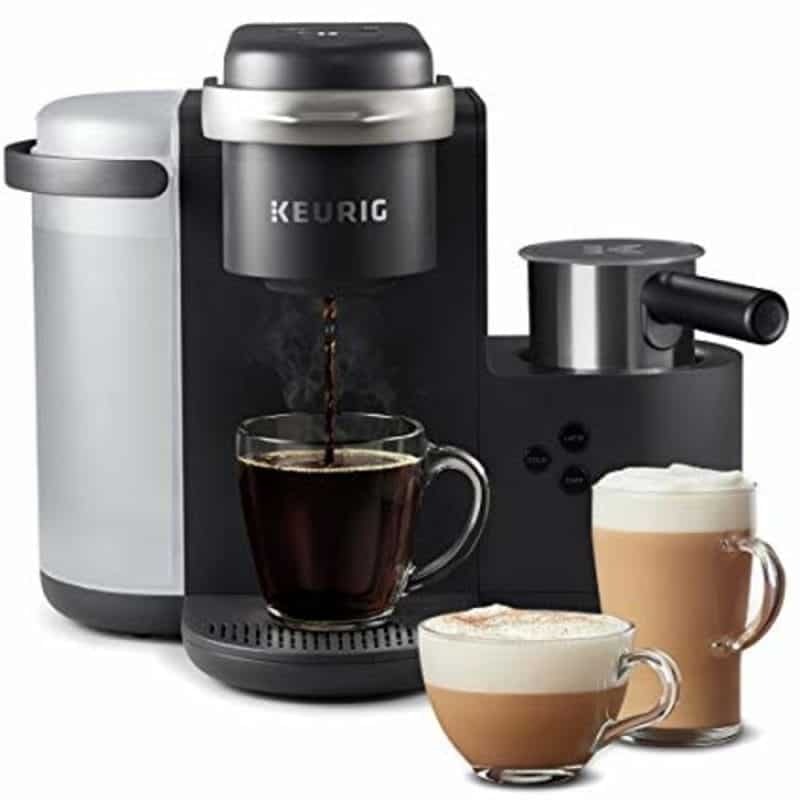 Before diving into the next best home cappuccino maker, first know that because this is a Keurig machine, only K-Cup coffee pods will be compatible. But regardless, this machine can brew a flavorful cappuccino, latte, and espressp in five different sizes, including a 2-ounce setting if you prefer shots. While there are plenty of cup sizes to choose from, and you can pick between a milder or stronger brew, what this machine lacks is a timer. In other words, you won’t be able to schedule your coffee to be brewed at a certain time. While this isn’t a big deal for some, it can be a drawback for others who like to wake up to freshly-brewed coffee. Other minor flaws with this Keurig models include the fact that this machine is larger, and thus, harder to store and that the cord is short, making it difficult to plug into outlets depending on their placement. Setting the latter cons aside, this moderately-priced Keurig machine provides high quality that some state could be comparable to that of a $1,000 machine while still making cappuccino-brewing simple. That said, selecting this machine is a good choice for those who are new to making cappuccinos or even regular coffee for that matter. Additionally, because you’ll receive 24 K-Cup coffee pods with your purchase, you’ll have plenty to experience with to find what flavors suit your taste buds the best. 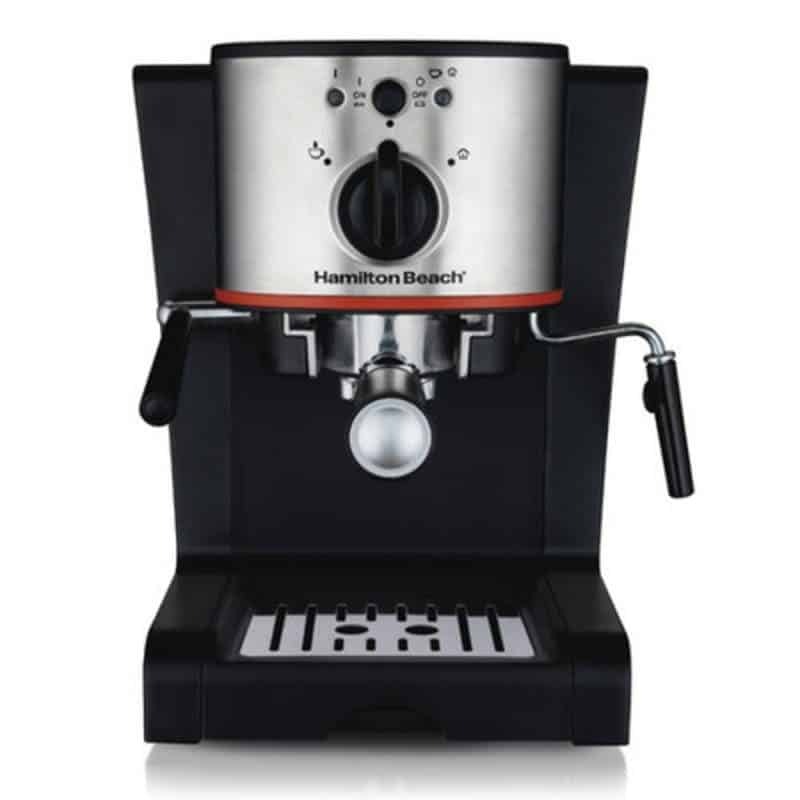 Coming to the European-inspired Hamilton Beach 40792 with frother, this tiny but mighty machine may not look like much, but for under $130, it meets most expectations. This cappuccino coffee maker flaunts a beautiful black, silver, and red exterior along with a removable water reservoir and drip tray and a swiveling steam wand to give you versatility, ease of brewing, and simple cleaning. One of the top features of this model is its patented Slide and Lock filter holder. With just two steps, one can just slide the filter holder forward and then lock it on the side to quickly secure your ground coffee without a hassle. On top of that, this compact unit offers the ability to personalize your espresso and steam plus a cup warmer to make your brew to your liking. While it’s at a favorable price and has a suitable amount of features, this Hamilton Beach unit does lack an LED/LCD screen. Sure, it’s a luxury feature, but many want a screen on their cappuccino maker as it’s convenient as it is aesthetic. Another minor con of this machine is the fact that it doesn’t quite accommodate taller cups. But the benefits of this machine are definitely overpowering. The price range is nice, the design is remarkable, the milk frother is a favorable size, and the water reservoir is easy to fill. All in all, it’s a great machine. If you’re looking for something a bit more luxurious, consider the Gaggia Brera Super Automatic Espresso Machine and Cappuccino Maker. It might be at the higher end of your budget, if not beyond your budget, as it’s priced at $539. 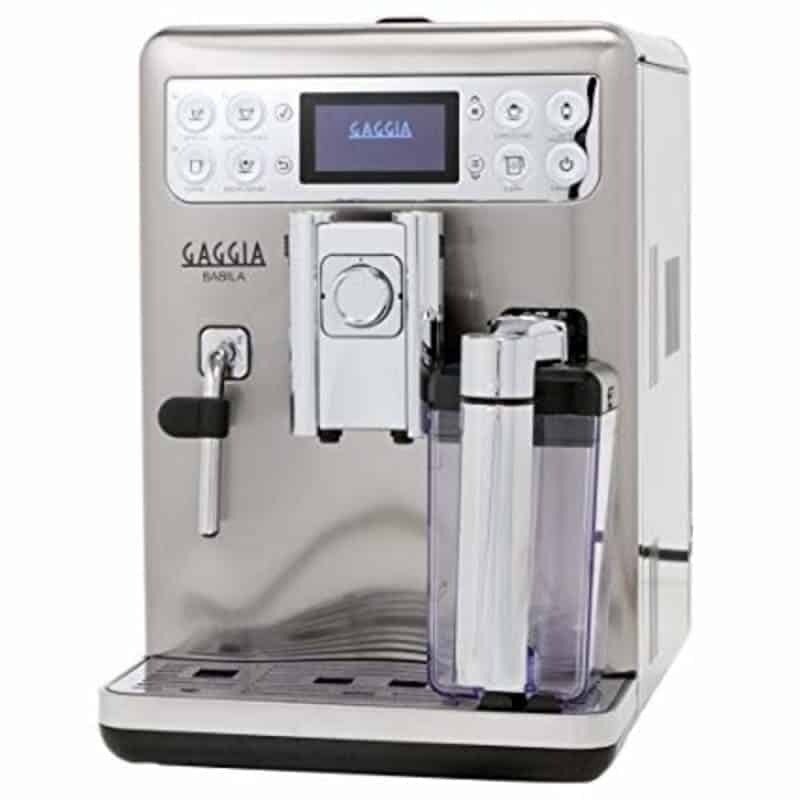 However, from the appearance of this machine to its overall features and capabilities, it’s hard to beat a Gaggia cappuccino espresso maker’s quality. The Gaggia Brera features a gorgeous and easy-to-use LED display and touch-button controls to allow you to quickly program your cappuccino or other beverage to your liking. Due to its rapid steam technology, this Gaggia cappuccino maker quickly heats up and delivers your espresso in no time, whether you’re brewing with beans or pre-ground coffee. Popping your cup over to the Brera’s integrated Pannarello wand frother, you can froth up your beverage for the perfect cappuccino or latte. The frother can also dispense hot water if you instead wish to make hot tea or an Americano. Although, one downside to this cappuccino maker is that even for its higher cost, you only get a one-year warranty. While Gaggia is a popular and trustworthy company, everyone knows that with technology, anything could go wrong at any point. Secondly, taller cups are a little difficult to place under the coffee dispenser. Additionally, the water reservoir is on the smaller side. But even with these cons, this cappuccino espresso maker has a quiet burr grinder, is affordable for being a Gaggia machine, and is incredibly quick and easy to clean thanks to self-cleaning. 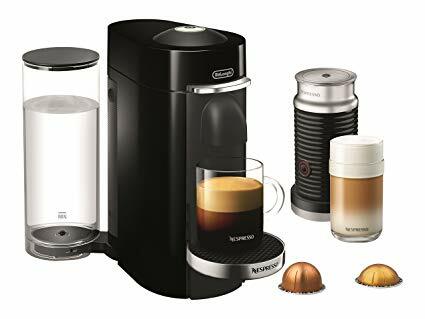 The Nespresso Creatista Plus can be deemed to be a top single serve cappuccino maker of all time thanks to its variety of features, one-of-a-kind appearance with a narrow design, and ability to accommodate shorter and larger cups and mugs. This Nespresso cappuccino maker is in the mid to higher range price-wise, but it claims to offer barista grade brews thanks to its plethora of settings for adjusting milk temperature, mixture, and coffee volume. Its quick-to-use intergrated milk frother alone offers eight different textures to pick from and 11 milk temperature settings from 113 to 168 degrees Fahrenheit. On top of that, the Nespresso Creatista Plus heats up in under three seconds, offers 19 bars of pressure, and automatically shuts off after nine minutes for convenience and energy-saving. While you already receive a lot for your money, Nespresso even throws in a welcome kit featuring 16 coffee capsules. Fortunately, there aren’t significant cons with this cappuccino espresso maker, but there are still some important cons to cover nevertheless. It only has a two-year warranty, which is pretty disappointing for an appliance that costs more than $600. Also, this machine is also only compatible with Nespresso coffee (which tend to be a bit expensive), but if you opt for a reusable pod, you can fill it with the ground coffee of your choice. Additionally, the LED screen is on the smaller side for some people and can be a pinch difficult to read. But overall, this model has it all. It scores much better reviews than the Nespresso Lattissma, so if you’re torn over which one to buy, get this one if you enjoy a perfect cup of the best coffee every time! So far, many of the cappuccino machines we’ve looked at are within the moderate to expensive range. This time, let’s look at the Miho CM-01A machine, which can perhaps be classified as the best cappuccino maker under 40 dollars – heck, probably the best espresso cappuccino maker under 100 dollars. Not only is it very affordable, but it’s also fairly compact in size, making it a great first cappuccino maker for someone living in an apartment or college dorm. Overall, this little guy can whip up to four cups of coffee at a time in its glass carafe which conveniently has measurements listed on the outside. It also has a switch knob and indicator light along with a removable, washable filter for simple operation and cleaning. It gets the job done and offers a decent frother to complete your beverage. Plus, it received Amazon’s Choice on Amazon.com. Being under $40, it’s hard to complain about this Miho cappuccino maker as there are machines out there 30 times its price. But every good consumer looks at the cons regardless. Some users claim that the materials on this machine are cheaper quality. Additionally, the steam arm is too short to accommodate taller cups, and it only offers 3.5 bars of pressure; 15 bars of pressure tends to be pretty standard for these appliances. It also doesn’t contain a lot of features nor an LED/LCD screen. In general, the Miho CM-01A machine shouldn’t necessarily meet everyone’s expectations due to its price. It’s a simple machine; sometimes that’s all people want. Next up, we have a the Capresso: the EC50, which has earned Amazon’s Choice on Amazon.com. 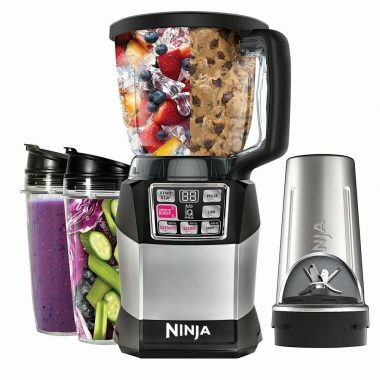 This machine is currently on sale for $87.95, originally $130. 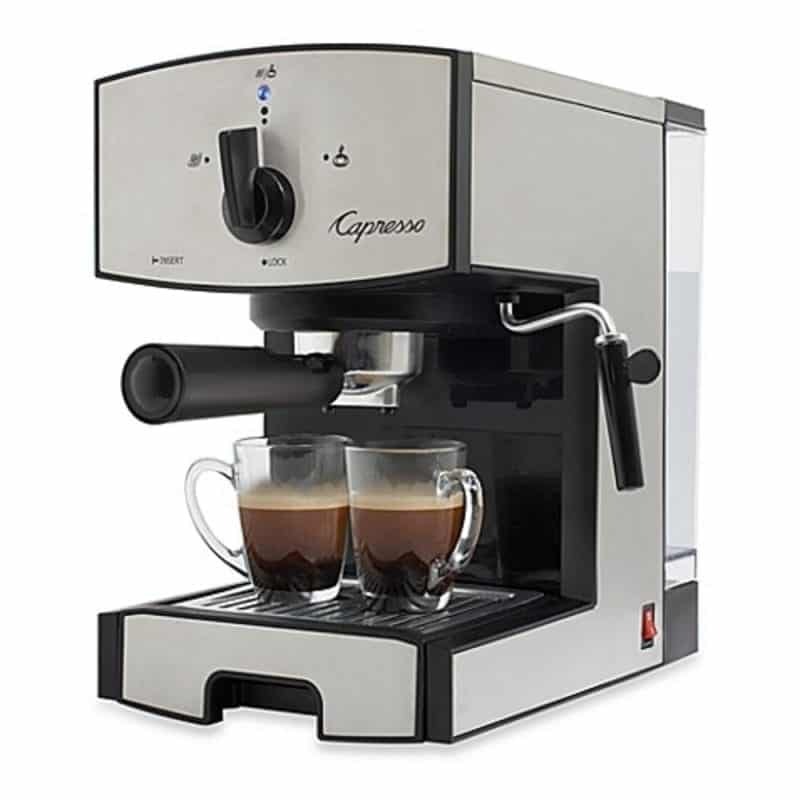 According to Capresso, this model offers quick brewing due to its stainless steel-lined Thermoblock. It also features its patented stainless-steel sieve for easy brewing. With its high-pressure frother, you can receive a quality froth to top off your brew. When it comes to cleaning the Capresso EC50 Espresso and Cappuccino Machine, there won’t be fuss nor hassle. Both its water reservoir and warming cup tray are removable for quick, easy cleaning. On top of that, it features an automatic rinsing cycle to ensure there won’t be a waiting time between brewing and milk-steaming. Generally, the Capresso EC50 is a good model if you’re looking for a coffee machine that is on the simpler side but still has credibility. It only weighs eight pounds, making it simple to store or travel with. But there are a few cons to look out for, such as the fact that there isn’t much space available to brew in a taller cup. As you can tell from the image below, there isn’t an LED/LCD screen if you were hoping to have one. Additionally, the water isn’t forced completely through the coffee, which can make clean-up inconvenient at times. But other than these cons, the EC50 is generally easy to clean, is affordable for many, and is consistent in its quality. 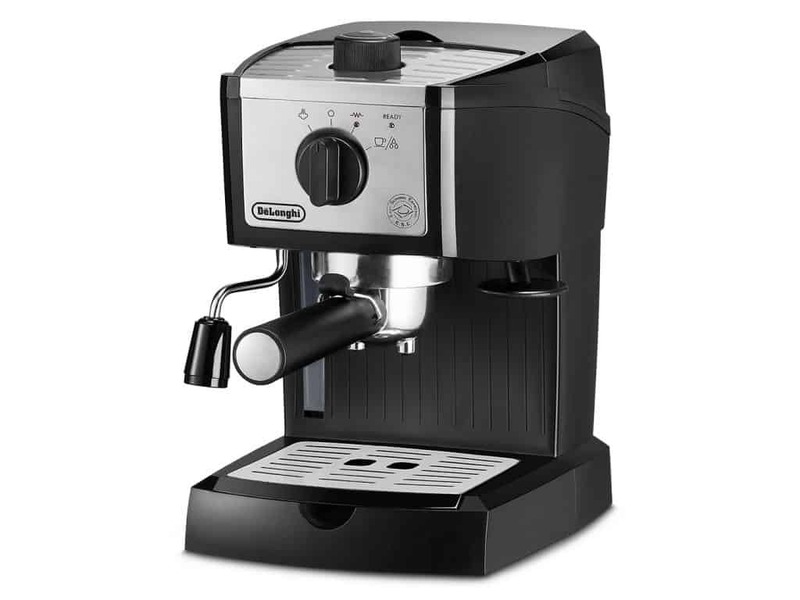 The Delonghi espresso cappuccino coffee maker, the EC155M, is a great model for under $100. It’s narrow shape and overall design make this machine attractive for both traditional and modern kitchens, offices, and the like. Even being a smaller and more affordable machine, this DeLonghi unit is equipped with a self-priming system, meaning it’s ready to brew at all times. Getting down to the features in specific, the DeLonghi EC155M Manual Espresso Machines feature two thermostats, one for steam temperature and one for water temperature. That said, you can make the perfect cappuccino to your liking. With the 3-in-1 filter holder provided by this machine, you can add one shot, two shots, or an ESE espresso pod depending on your personal preferences. To top your brew off, the frother is one of the best out there. With the ready indicator light on this machine, you’ll know right when it’s time to froth. This machine is a great buy, but one of the downsides is that the water reservoir can only accommodate 35 ounces of water at a time. Additionally, if you end up purchasing this machine, consider purchasing a separate pitcher as the steam wand sits low. Some also complain that there is a rattling, vibration sound coming from the machine mid-brewing. But if you can set those tiny cons aside, you’ll be happy with this one. Now let’s take a look at the Nespresso Vertuo, which is a really affordable appliance. Just like with the Nespresso Creatista, Nespresso also claims the Vertuo has barista grade quality with the simple click of a button. With three different cup size options and patented CentrifusionTM technology, the Vertuo can blend up your cappuccino with the perfect coffee-to-water ratio. Being a slimmer machine, this is an ideal cappuccino machine for office spaces. But before you think about getting this machine, keep in mind that this model is only compatible with Nespresso Vertuo coffee capsules. You can use a reusable pod for brewing ground coffee, but you would need a grinder if you prefer to use freshly-ground coffee. For some people, the pod issue isn’t that big of a deal. 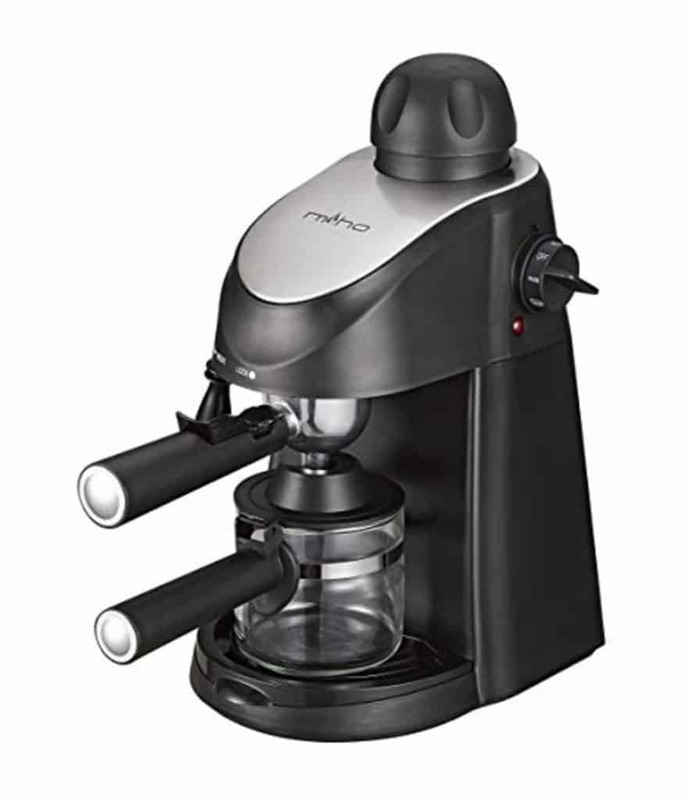 In fact, you’ll receive 12 coffee pods with your purchase of this Nespresso cappuccino maker. This automatic Breville machine is quite popular and has received an average 4.4 stars on Amazon; however, there are a few cons to address: it doesn’t have an LED/LCD screen, there are minimal customization options, and the milk frother is separate from the machine. As you can see, there are just a few negatives to this home cappuccino machine. 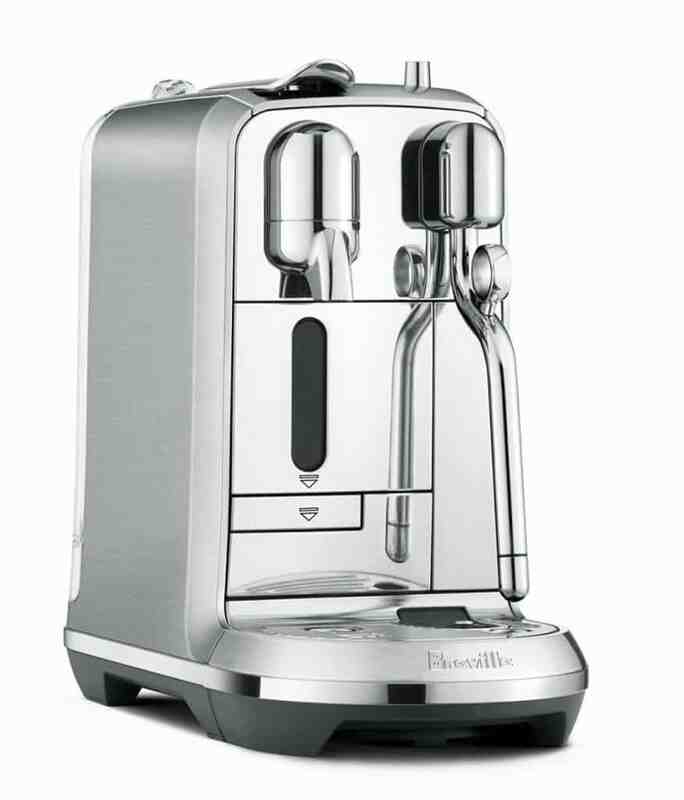 But with a great price, heavy-duty components, great performance and ideal froth, great customer service from Breville, and the chance of free shipping if you buy online, considering purchasing the Vertuo is not a bad idea. 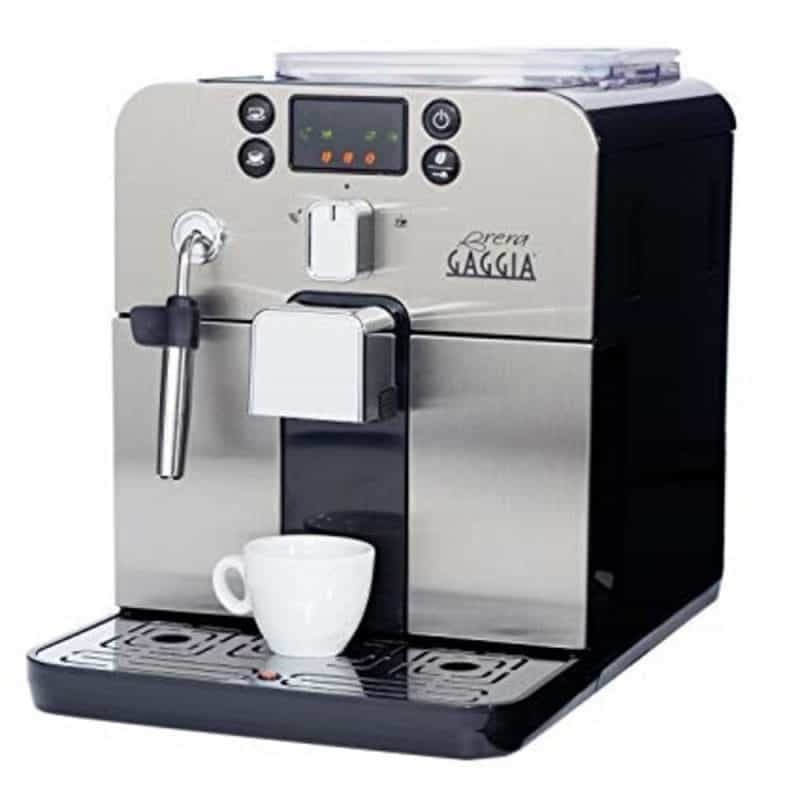 The Gaggia RI91700/64 Babila Espresso Machine and Cappuccino Maker is one of the best cappuccino machine models you’ll come across with an average of 4.8 stars on Amazon. As a downside, it’s over $1,000, but if you’re okay with spending that much for a home appliance, it might just be your next big purchase. This coffee maker with frother, apart from its overall attractive design, offers simple, one-touch brewing and frothing with eight different brewing options from ristretto to macchiato. The manual steam wand apart of this machine doesn’t just froth; it can also dispense hot water if you’re in the mood for tea instead. Besides providing a convenient and personalized brew, the Gaggia RI91700/64 is easy to clean as it offers automatic cleaning and descaling. But coming to the cons, while there aren’t many, this Gaggia unit could use a larger bean hopper as it sometimes runs out while in the middle of a brewing session. And for the price, a two-year warranty seems stingy, but if you have trust in Gaggia that their machine will last well beyond that, then you’re set to go. When it comes down to decision time, the pros definitely outweigh the minor gripes of this Gaggia unit. If you’re ready to buy but still can’t make up you mind, maybe one of these frequently asked questions helps you with your indecision, and matches you with your perfect kitchen appliance! What is a cappuccino maker used for besides cappuccinos? Besides cappuccinos, a you can brew both espressos and lattes. 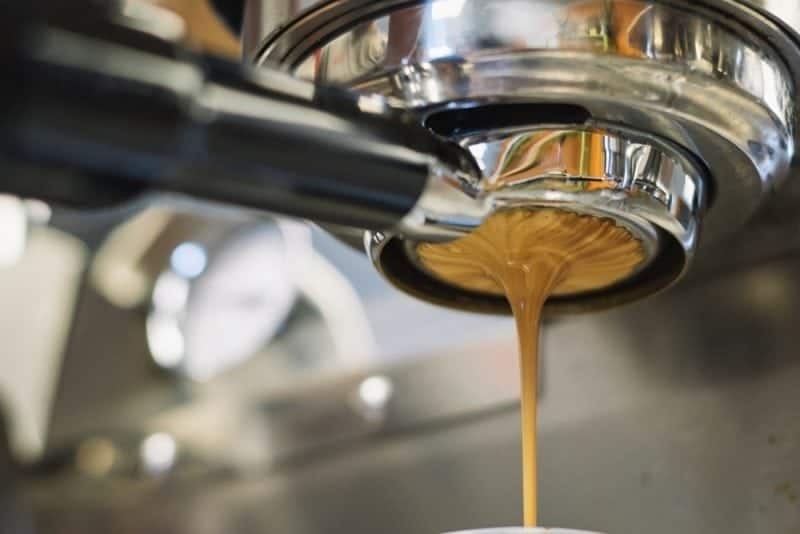 Because these machiness not only brew coffee but also can steam and froth liquids (e.g., milk) via its steam wand, both cappuccinos and lattes can be made, or just a plain espresso if the steam wand/frother is not used. How to use cappuccino maker? Different models operate a little differently, which is why it will be important to turn to your user manual for instructions. But overall, most models operate in a similar way. After brewing your espresso, the frothing process will come afterward either by using the frothing wand over your coffee or by pouring frothed milk from a pitcher over your coffee. How to use Keurig cappuccino maker? Different from your average cappuccino maker, Keurig cappuccino machines operate a tad differently as they are compatible with coffee pods. But there are also different Keurig models out there. That said, you’re going to want to refer to your user manual to see how to use your particular model. Place the coffee pod of your choice in the brewer. Put a cup or mug on the drip tray under where the coffee will be expelled. Select the cup size of your preference. While your coffee is brewing, pour milk in the frothing pitcher to the appropriate level, place the lid back on, and pop the pitcher back into your cappuccino maker. Press the cappuccino froth button. After the frothing cycle is complete, remove both your cup of coffee and the frothing pitcher. Pour the content of your pitcher over your coffee. That’s it! These machines work by heating water and then pushing that hot water through ground coffee to provide the perfect brew. After brewing coffee, a cappuccino maker with frother will use steam in order to froth milk for the final touch. Which cappuccino maker is best? Regardless of how popular or how many reviews a model has, it is still important to weigh the pros and cons of each machine you come across and look at the specs to ensure it’s right for you personally. Why are cappuccino machines so expensive? Not every cappuccino machine is expensive. While price sometimes indicates quality (but not always), you can absolutely find a quality coffee and cappuccino maker for an affordable cost. Take the Miho CM-01A Espresso Machine 3.5 Bar Steam Cappuccino and Latte Maker for example. 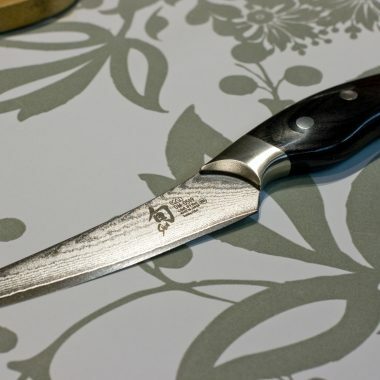 This model is under $40, yet leaves many customers happy. As for the absolute best cappuccino makers out there, these are of course going to be pricier for different reasons: patented technology, higher-end brand name, stainless steel or other favorable materials, special features, fancy LED screen, importation from Europe, long warranty, high quality overall, and so on. But the thing to remember is, you can definitely find the best cappuccino maker for you within your price range.